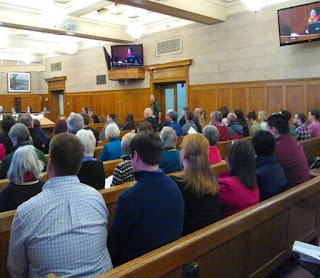 the Northern Worker: The People Demand "Earned Safe and Sick Time"
The People Demand "Earned Safe and Sick Time"
Over 100 people turned out at the Duluth City Council meeting on Mar. 26 for the discussion about whether to pass an Earned Safe & Sick Time ordinance. The proposed ordinance would require local employers to allow all of their workers to earn a certain number of paid days off each year – something that is currently limited to mostly union workers. With the ESST, workers would no longer be forced to come in to work when they are sick out of fear of being fired, or missing a much needed day of pay. Instead, throughout the year they would earn a bank of paid hours that can be used for when they are sick, or for other emergencies. While about a dozen local capitalists were on hand to cajole, plead and threaten that they shouldn’t be made to dip into their profits for such things, the overwhelming majority of folks present were very much in support of the proposal. At the outset of the meeting, Councilor Fosle asked for time to make an “apology” for an offensive comment he had made at a previous meeting where he chided a woman for “choosing” to get pregnant and have a miscarriage. His apology however was more a defense of himself and a call for criticism of him to end. The public wasn’t allowed to comment about Fosle’s “apology”, but under the comment time allotted later for the Earned Safe & Sick Time proposal, Andromeda Lee made a point of taking him on. Despite repeated attempts by the Council President to rule her out of order, Andromeda persisted in delivering a powerful, off the cuff rebuttal. She concluded by pointing out how this kind of disrespect and lack of compassion is exactly why we need to pass ordinances like Earned Safe and Sick Time. Afterwards a number of speakers from labor, the Feminist Action Collective, progressive business owners who have already initiated similar policies and others spoke passionately and powerfully for the need for Earned Safe and Sick Time. The meeting, as many government meetings do, ended rather anti-climatically. While the Council took up several proposed amendments, the ordinance itself was note voted on. It is uncertain when it will get a yes or no vote, but the earliest time that vote could happen is at the next Council meeting, two weeks from now. Supporters of workers’ rights and healthcare for all are urged to attend. And bring a friend! The editorial collective of the Northern Worker would like to extend our special, heart felt thanks to Andromeda for having the courage to make her powerful stand against Fosle, and to all of the other awesome speakers. And of course a heart felt thank you and appreciation for the hard work of Ashley Northley, Katie Humphrey, and all of the other amazing organizers who are working so hard on this issue. We can and will win this! >> The article above was written by Adam Ritscher, VP of United Steelworkers Local 9460 and member of Socialist Action. To stay in the loop about the fight for Earned Safe and Sick Time, look up “Vision Duluth” on facebook.